Thoughts in a Makeshift Mortuary (Michael Joseph London, 1989; Grafton, 1990, Umuzi 2014) deals with the tragic effects of apartheid violence and hatred on young South Africans, and is also a double love story spanning thirty years. Thoughts was a finalist for the 1989 CNA Literary Award, and was published by Econ Verlag in Germany under the title Tief im Süden. The profoundly tragic photograph which propelled me into writing this first novel appeared on the front page of the Sunday Times on 22 December 1985: Jacqui Quin and her husband Leon Meyer lying dead on a floor, side by side under a bloody sheet. Tens of thousands of young people were being caught up in our country’s raging turmoil. At that time our older daughters were university students and the youngest had spent her first high school year in one of South Africa’s only two non-segregated schools. I was so appalled by the vision of a young woman like them assassinated in her home, that I kept the cutting and subsequent articles about the funeral in Lesotho. Two weeks later I sat down one evening and started writing this fiction. My characters are imagined, not based on the people involved, and this is a fictional village. It was the horror of the cross-border raids being planned and executed by shadowy men sent by the Nationalist government, and the terrible toll that monstrous policy was taking on innocent people, that drove me on. The ANC was still banned and newspapers were censored, though if you read them carefully you could pick up information that slipped through. As a freelance journalist, I knew journalists and writers who told me things they couldn’t write about; I also had friends with connections to the struggle. Nobody at that time could say for certain who was involved in the raids. As I wrote, the stories of the fictional young couple, Rose and Jake, and Rose’s parents, Sarah and Gordon, became intertwined over the decades between the 50s and the 80s in South Africa. I could not have written them without my experiences as a journalist, particularly working and writing for Thandi, then part of Bona magazine, during the years 1978 to 1982, which took me into the lives and traumas of many black women. The book took nearly two years to write between other assignments. Michael Joseph published it in 1989, followed by Grafton with the paperback edition in 1990 and translated in Germany in two 1995 editions. What shook me most about readers’ reactions was the almost universal, ‘But I didn’t know all this was happening in our country!’ It was too easy during those decades not to know, to blind oneself to the realities and not to listen to the voices being raised against injustices. But we know now. Information about the cross-border raids began to emerge during the 1990s. Here are the details of the killing which inspired Thoughts in a Makeshift Mortuary as they appeared in newspaper reports, and I give them for two reasons: to tell the story of what really happened, and because atrocities like this must never, never happen again. Seven people were murdered in the first house: Lulamile Dantile, Nomkhosi Mini, Vivian Mathee, Joseph Mayoli, Makaelane Mohatle, Boemo Tau and Amelia Lesenyeho. I hope this book dedicated to Jacqui, while fiction, reminds readers of the sacrifices she and many others made, and of their bravery. Remember. 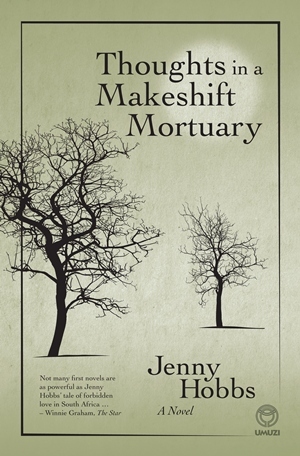 Sue Grant-Marshall interviewed author Jenny Hobbs about her first book, Thoughts in a Makeshift Mortuary, which has just been re-published by Umuzi. They also discussed the Franchhoek Literary Festival, www.flf.co.za which takes place from 16 to 18 May 2014.